If the tasks are dependent on each other, then they can be linked in gantt chart. Linking tasks gives a good view of what’s next. In case of dependent tasks, if the first task is postponed you don’t need to go to every task and change the dates. All the dependent tasks get dragged along with the first task. Go to the task for which dependency needs to be set. Next to each task, there is a small circle. By clicking on this and dragging the mouse to another task, you can link the tasks together. Once the tasks are linked, the task that you dragged will be dependent on the first task. To enable dependencies and before dragging the first task you need to enable Cascade changes. To turn on the cascade changes select More options and check off cascade changes. 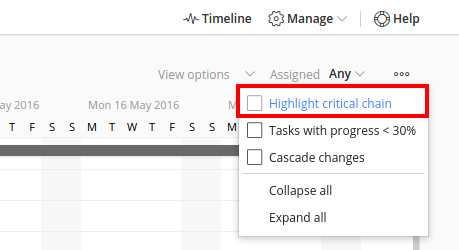 Highlighting the critical path allows you to see at a glance the tasks that are currently affecting your project end date directly.